We are now past the halfway point in both the men’s and women’s swim and dive seasons, and the competition is really starting to heat up. Over the break, the men’s team struggled with numerous losses, while the women’s team gained momentum, winning four consecutive meets before a tough loss to a league rival. In the first meet of 2019, the men were ousted by NESCAC competitor Hamilton 158-113. 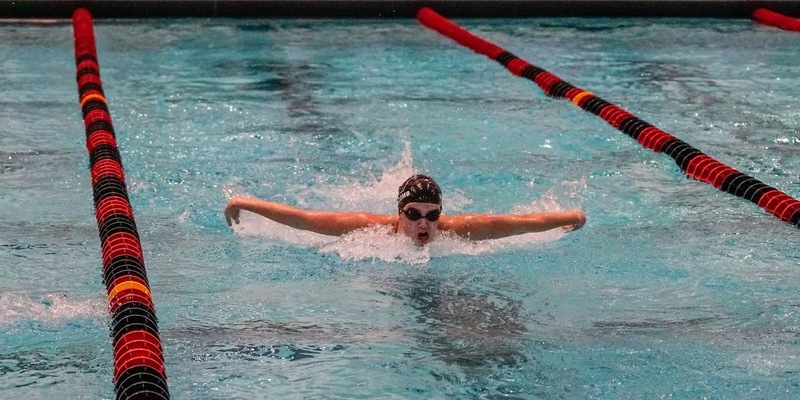 The Cardinals were led by diver Brandon Pearson ’19 and swimmer Nicolas Moran ’21, who both posted a pair of first-place finishes in their respective events. Moran picked up a pair of first-place finishes in the 25-yard fly (11.31) and the 50-yard fly (25.07), while clocking in at 24.17 in the 50-yard free, which was earned third place. 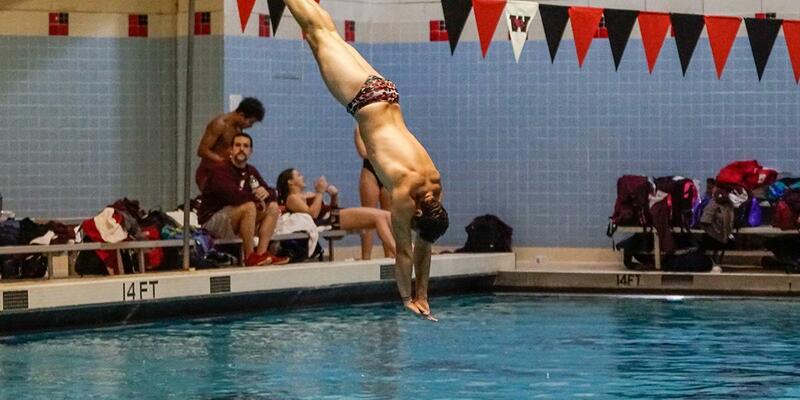 Wesleyan swept the 1-meter and 3-meter events off the diving boards, with Pearson earning first off the 1-meter with a mark of 248.63, followed by Joel Groves ’21 with a mark of 117.75. Pearson (230.76) and Groves (132.38) finished first and second, respectively, off the 3-meter board. Senior Eren Kiris earned his first collegiate win, coming in first in the 50-yard back with a time of 27.12. After a week-long training trip in Florida, the men hit the water once again in a tri-meet against Roger Williams University and Springfield College, losing by scores of 227-57 and 218-71, respectively. In the meet, newcomer Jared Christopher ’22 snagged second in the 1,000-yard freestyle, clocking in at 10:19.77, while placing fourth in the 500-yard freestyle with a time of 5:04.65. Christopher also earned a fifth-place finish in the 200-yard IM with a time of 2:15.21. Fellow first-year Jeff Haegelin earned third place honors in the 200-yard butterfly with a time of 2:05.11, while also placing third in the 100-yard butterfly (55.59). The next two meets for the team were losses to Colby (163-107) and Bowdoin (230-63). Against the Mules, Wesleyan’s Christopher, Max Wimer ’19, and Andrew Schwartz ’20 earned first-, second-, and third-place finishes, respectively, in the 500-yard freestyle. Christopher also earned first-place honors in the 100-yard IM with a time of 1:00.79. Off the 1-meter board, diver Charlie Vogel ’21 came in first place with a mark of 106.45, while Groves earned second place with a mark of 94.30. Off the 3-meter board, Groves earned a second-place finish with a mark of 141.60, while Vogel came in fourth with a mark of 85.70. The three 200-yard freestyle relay teams earned first, second and third place. The team had a tougher time scraping together points against the icy Bowdoin Polar Bears. The 400-yard freestyle relay team (Moran, Haegelin, Wimer and Phon Leewadtrakul ’19) came in second place, clocking in at 3:26.26. Second-place finishes included Christopher in the 1000-yard free (10:13.29), Schwartz in the 100-yard free (52.45), and Haegelin in the 500-yard free (5:10.79). Fortunately, the women’s team had a handful of impressive performances over winter break. The Cardinals started off the new year right with a 183-94 victory over rival Hamilton. Caroline Murphy ’20 and Mengmeng Gibbs ’22 once again led the team, proving victorious in all four of their events. Gibbs placed first in the 25-yard breast (14.25), 50-yard breast (31.90), and the 100-yard IM (1:02.37). Murphy was victorious in both of her individual races, posting times of 11.54 in the 25-yard free and 27.66 in the 50-yard back. First-year Rachel Townsend earned her first collegiate win, taking the top slot in the 25-yard fly with a time of 12.80. Townsend also came in second in the 50-yard breast (33.02) and third in the 50-yard fly (27.86). Hannah O’Halloran ’20 earned the top spot in the 200-yard free with a time of 2:01.55, while placing third in the 25-yard back (13.95) and the 50-yard back (29.35). Devon Cooper ’19 placed first off the 1-meter board with a mark of 221.92. The following week-long training trip to Florida only seemed to help the team improve, as they swept their first meet back, defeating both Roger Williams (188-95) and Springfield (150-138). In the 1000-yard freestyle, Maela Whitcomb ’19 came in first place with a time of 11:14.60, five seconds ahead of the second-place finisher. Whitcomb also came in second in the 200-yard IM (2:16.01) and third in the 200-yard backstroke (2:14.44). Julia Dietz ’19 clocked in at 1:02.47 in the 100-yard backstroke, which was good for third place. O’Halloran earned first place honors in the 100-yard breaststroke with a time of 1:00.16 and also claimed the top spot in the 500-yard freestyle with a time of 5:25.20. The 200-yard freestyle relay team (Murphy, O’Halloran, Sophia Antonio ’19, and Grace Middleton ’20) came in first place with a time of 1:39.36. The next weekend was an important one for the Cardinals and they handled the pressure well. In a 157-143 victory against Colby, the team recorded ten first-place finishes. Murphy earned first in the 50-yard backstroke with a time of 27.69, while Dietz came in second (28.93). Townsend earned first-place honors in the 100-yard breaststroke with a time of 1:11.37. The 400-yard medley relay team composed of Murphy, Gibbs, Whitcomb, and Middleton took first place with a time of 4:03.60. Off the 1-meter board, Cooper snagged the top spot with a mark of 198.20. Erin Angell ’19 came in third with a mark of 177.65, while first-year Talia Lanckton finished fourth (162.70). Wesleyan’s stellar performance was enough to thrust the team into legitimate NESCAC contention. The next challenger, Bowdoin, ousted the Cardinals 178-117 in a tough match. Murphy won the 100-yard back (58.85) and the 100-yard free (54.99), while Gibbs claimed the 100-yard breast (1:09.04) and 200-yard back (2:29.41). Middleton earned first place for the Cardinals in the 50-yard free with a time of 25.35, with runner-up finishes from Kylie Han ’19 in the 100-yard breast (1:10.21), Middleton in the 100-yard free (55.09), and O’Halloran in the 200-yard back (2:09.58). Despite the loss, if the Cardinals can keep producing victories, they will be a concern for the rest of the NESCAC in the coming months. Both the men’s and women’s teams return to action when they host the Coast Guard Academy, Connecticut College, and Fairfield University on Friday, Feb. 1 at 6:30 p.m.
Nick Keating can be reached at nkeating@wesleyan.edu.